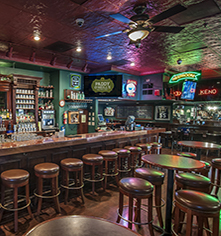 Drenched in Old World Irish charm with the comfort of a jovial neighborhood tavern, guests can sample fine Irish whisky, sip on a cold draft brew, or feast on traditional Irish fare and mouthwatering American favorites. Guests can also enjoy live entertainment from local favorites. With a copper-top bar and rich dark wooden furnishings inside, to a casual outdoor patio in the summer, Paddy O’Neill’s has it all. There is no dress code; casual dress is the standard. Daily, 11:00 a.m. - 2:00 a.m. 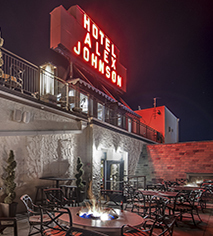 Guests staying at Hotel Alex Johnson receive complimentary access to Vertex Sky Bar, located on the top two levels of the hotel. The panoramic beauty of the Black Hills and a delectable menu of craft cocktails, appetizers, salads, savory entrees, and exquisite desserts are a delight to the senses. Whether the occasion is a convivial happy hour, a private party, or simply dinner with a view, Vertex Sky Bar graces their guests with excellent service in a splendid environment of new heights. There is no dress code, casual to business casual is appropriate. Sunday to Thursday, 4:00 p.m. - 12:00 a.m.
Friday & Saturday, 4:00 - 2:00 a.m. 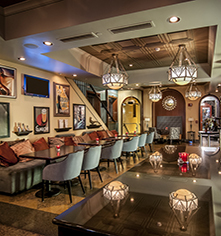 The hotel features a warm, welcoming neighborhood atmosphere within the Starbucks and is a great place to meet friends. Daily, 5:00 a.m. - 8:00 p.m. Guests of Hotel Alex Johnson can enjoy a sweet treat, right in the lobby. Chubby Chipmunk’s hand-dipped chocolates have been featured in gift baskets at the Country Music Awards and the 2013 Grammy Awards. Tasty treats are also available to take home. Daily, 10:00 a.m. - 8:00 p.m.